A visit led by Anna Liu and Mike Tonkin of Tonkin Liu Architects, at which AA Members will be granted exclusive access to The Sun Rain Room. 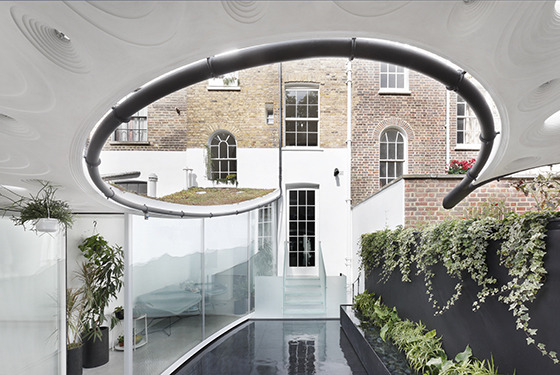 The award winning two-storey extension and restoration of a Grade-II Listed Georgian townhouse serves as both a studio for the practice and a home for the partners’ family. Each of Tonkin Liu’s projects embodies our relationship to nature. In Sun Rain Room the perimeter walls of the rear courtyard support a plywood roof, curved in plan and section to allow maximum light into a patio garden. Rainwater gathered at the top of the townhouse falls through a pipe, following the roof’s curving leading edge to a spout over a long rainwater harvesting tank. The tank floods the patio at the push of a button, transforming it into a reflecting pool, and bouncing raindrops are illuminated by a beam of light. Posted on October 9, 2018 September 28, 2018 by membership	Bookmark the permalink.